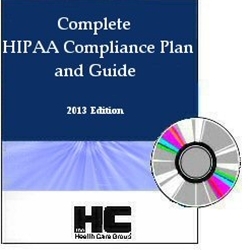 The Complete HIPAA Compliance Plan and Guide is a comprehensive self-help guide to implementing the Privacy, Security and Breach Notification Rules contained in HIPAA; the Plan and Guide serves as a one-stop shop for your Practice to create and implement a HIPAA-compliant Compliance Plan, and is fully updated to include the recent HIPAA mega-rule promulgated in late-January, 2013. Included is a Staff Privacy/Security Training PowerPoint presentation (CD format) to facilitate effective HIPAA-required staff training. The CD also contains additional compliance-related training, and in particular, a detailed discussion of the breach notification rules, including pertinent definitions, examples of what constitutes a breach�, notification requirements, and a sample breach notification letter, to ensure that your Practice is aware of what to do should a breach occur. Given the enormous costs and penalties that your practice could face as a result of a breach, this information is truly something that your practice cannot do without! Also included is an updated Business Associate Agreement template that is adaptable to your practice's needs, as well as a helpful checklist for you to evaluate Business Associate Agreements prepared by those outside of your practice to make sure that your practice is protected. Other helpful exhibits include a Notice of Privacy Practices template and Authorization form. A link to the press release from HHS and to the text of the Final Rule can be found below.